My work has been called 'realistic' and 'traditional', yet I feel that it extends beyond the boundaries of these two labels. Perhaps 'interpretive realism, traditionally inspired'may be a closer description. My influences are the Italian Renaissance painters and Van Eyck and Bruegel the Younger. I admire the work of KatheKollwitz, Eric Freifeld, and Stanley Spencer. I had many great teachers, but the greatest were the works in the drawing cabinets,museums, and churches of Europe, where I lived for three years. 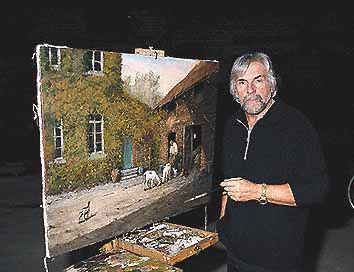 I came to maturity as an artist while living and painting in the small village in Italy where my family came from. All of my line drawings are done on location. Later (sometimes years later), I work out the lights and shadows in my studio, creating the atmosphere I want to convey. These finished drawings are then used for information when I come to do the paintings. Although the misty, dreamlike quality of Italian light, so different from North American light, came through in my earlier works, I am more interested at this point in bringing out shadows, which have their own lights. I want the viewer to be drawn into the work,to be captured by the detail, to step closer and discover what is in it. But although I paint technically, I hope people will look beyond the detail to find deeper meaning. My work is spiritual, although I am not religious. Rather than achieving a photo-realistic likeness, I try to capture the feeling I get from a mental visualization of my subject. I imagine it rather than copy it. Subject matter is less important than mood and feeling, both of which come within myself. This is why I would call my work interpretive. I put so much of myself into my paintings that, in a sense, each one becomes a self-portrait.-Tony Luciani Close text. This Account Created Oct 1, 2000 5:17 pm.